Location: The site of the roadside building is lost under the roundabout at the southern end of the A3220 (M41). The line still runs beneath the roundabout into a new Shepherds Bush station a little to the north of Uxbridge Road. Notes: Although the West London Line reopened between Willesden and Clapham Junction on 2nd March 1863 there was no station at Shepherd Bush as there had been in 1844 when the line first opened. 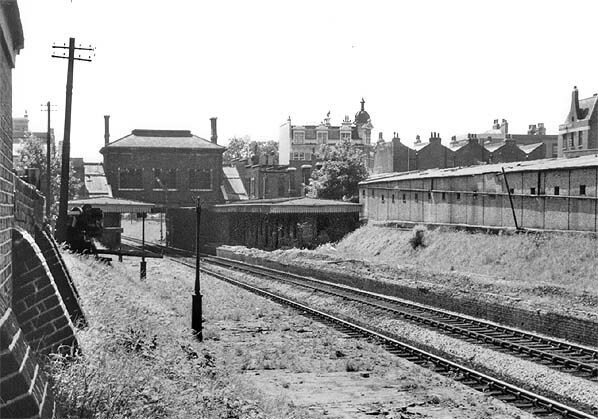 A spur from the Hammersmith & City line at Latimer Road to the West London line at Shepherds Bush opened on the 13th July 1864 and the Great Western introduced a service from Moorgate to Kensington. As there was no station at Shepherds Bush the Great Western is believed to have opened a temporary station at the southern end of the spur line in 1864. Contemporary maps show the station was built but it is unclear whether it was ever used. It would have been abandoned when Uxbridge Road Station opened on the north side of Uxbridge Road on 1st November 1869 a little to the south of the site of the original 1844 Shepherds Bush Station and east of the LNWR's coal depot. 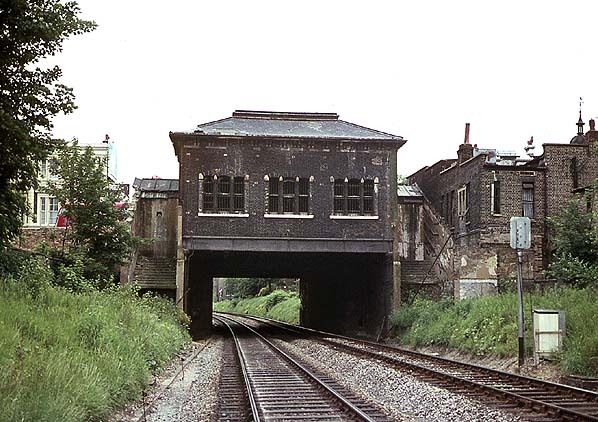 The station had a large brick building on the north side of Uxbridge Road with two entrances onto the street protected by two glass canopies. Covered stairs led down from the roadside building to the platforms. Each platform had a similar building comprising waiting rooms, toilets etc and a canopy. At a later date a footbridge was provided at the north end of the station with direct access to a wide arcaded covered way to the White City. The entrance was also substantially altered with a single entrance in the centre of the building and two shops either side. The station suffered during the blitz. During September and October 1940 the station and goods yard were hit nine times and the station was eventually closed on 21st October 1940 although it continued to appear on underground maps until 1947. After the war the station was still largely intact although the platform edging and footbridge were removed, probably in the early 1950's and by the 1960's the platforms had been removed leaving just the roadside building on Uxbridge Road and the top part of the stairs down to the platforms. The adjacent goods depot was closed in November 1967 and the street level building was demolished in July 1968 shortly before construction of the M41 motorway (now the A3220) and the Shepherds Bush roundabout started. 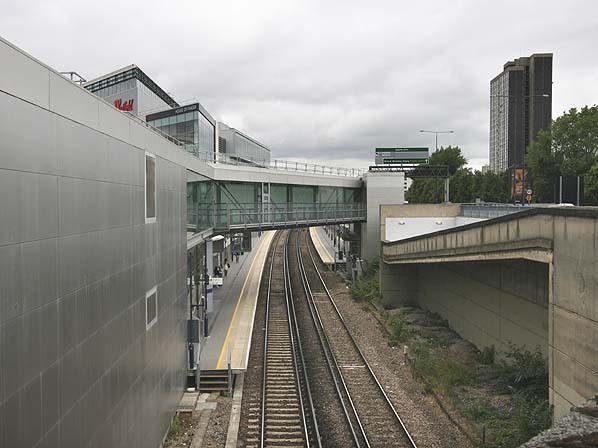 new station was due to open in 2007 but failed an inspection after completion as the northbound platform was 18" too narrow narrow; two passengers were unable to pass on the platforms without stepping over the yellow safety line. Once the platform had been widened the new station eventually opened on 28th September 2008 as an interchange with Shepherd's Bush Central Line station and a new bus station.. The line remained in service as an important freight link. After the war only the short section of line between Kensington and Earls Court was reopened for passenger traffic with the service being provided by London Transport’s District Line from 19th December 1946, but only when there was an exhibition at Olympia. A workmen's steam hauled passenger service ran between Clapham Junction and Kensington with two trains in the morning rush hour and two in the evening. This service received little promotion and most people were unaware of its existence. With the closure of Nine Elms depot in 1967 diesels took over the service. Most of the conductor rails between Kensington and Willesden were removed between 1946 - 1952.
holiday excursions and special cross country workings were common. On 24th May 1966 the West London Line received a new lease of life with the opening of the Motorail terminal at Kensington, with car-transport services to a wide range of destinations in Scotland, Wales and the West Country. These services ceased in 1988 and the Motorail terminal closed. It’s now used as a covered car-park and the reception area is now the booking hall and ticket office. Street via Reading was discontinued in December 2008. 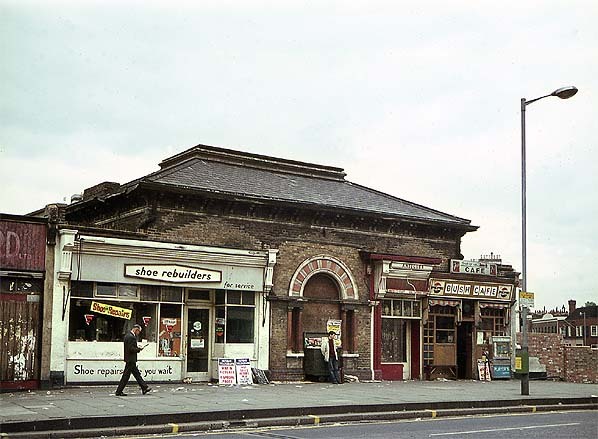 Uxbridge Road station entrance c.1967. 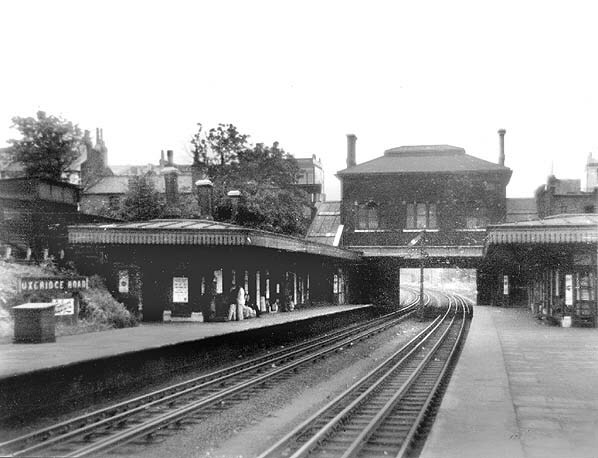 Compare this to the early 20th century picture, the station building has been considerably altered. 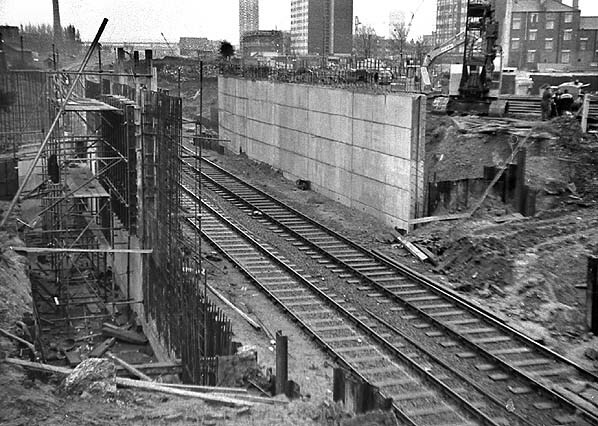 The site of Uxbridge Road Station looking north in 1968 during the construction of the Shepherds Bush roundabout at the south end of the M41. 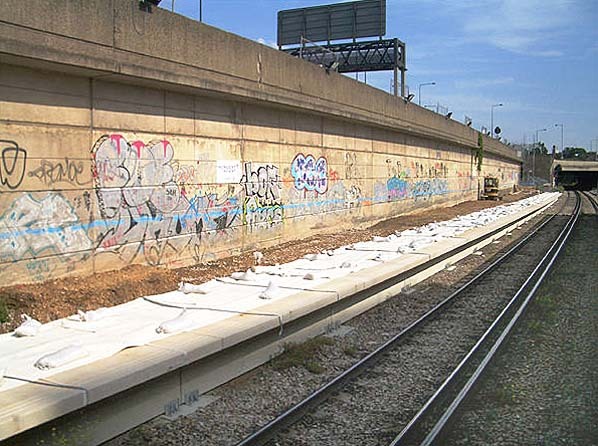 The site of Uxbridge Road Station looking north in July 2009. 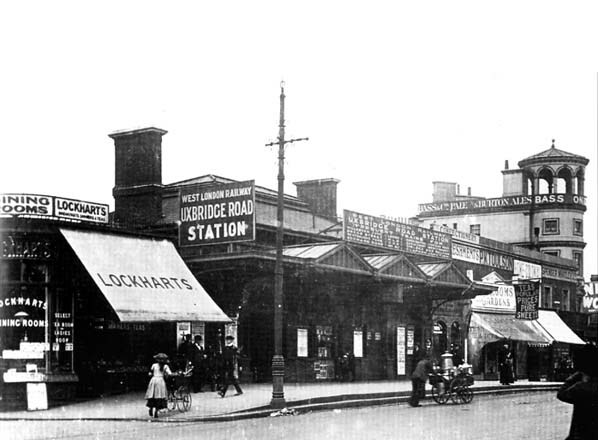 The original station entrance would have been some distance behind the photographer in the middle of the Shepherds Bush roundabout so the new station is slightly further north.